A change in slitting tools at Dedoes Innovative Manufacturing increases turret-press uptime, while use of cluster and special-application tooling delivers additional productivity benefits. Dedoes punches 2000 tons of cold-rolled mild and stainless steel each month, and depends heavily on its slitting tool to accurately size sheets into components used in filtration cabinets and other products. Its new slitting tool has reduced tool sharpening by a factor of four to one. Less can be a lot more when it comes to the innovative use of special turret-press tooling at Dedoes Innovative Mfg., Fowlerville, MI. 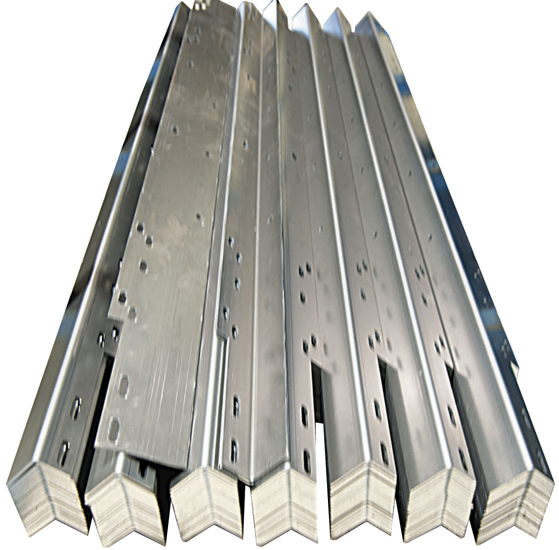 The sheetmetal fabricator uses a large array of cluster, louver, emboss, lance and form tools that greatly reduces fabricating steps, punch press time and secondary operations. The firm fabricates specialized cabinets for customers in the medical, military, automotive, food and material-handling industries. Dedoes punches 2000 tons of cold-rolled mild and stainless steel each month, much of it requiring slitting with its turret press, an Amada 357 Vipros Queen. The company depends heavily on its slitting tool to accurately size sheets into components used in filtration cabinets and other products. It recently switched slitting tools (opting for a tool from Mate Precision Tooling, Anoka, MN), and was able to reduce tool sharpening by a factor of four to one. “The improved durability of the slitting tool has eliminated numerous trips to the tool grinder,” says Vaughn, “which means a huge reduction in downtime. Special-application tooling plays a vital role at Dedoes, such as this nine-hole cluster punch used to punch thousands of 0.1875-in.-dia. holes in 14-gauge Type 304 stainless steel. Special-application tooling also plays a vital role at Dedoes, “because it expands the usefulness of the firm’s turret press,” says Mate sales engineer Gary Troxell. As an example, Troxell notes filtration-system cabinets fabricated at Dedoes from 14-gauge Type 304 stainless steel. Measuring 5 by 4 by 3 ft., the cabinets incorporate multiple filtration assemblies and require the punching of thousands of 0.1875-in.-dia. holes spaced 0.45 in. apart. When punching the panels with the single-station tool supplied with the turret press, Dedoes discovered obvious limitations, particularly as order volumes grew for the punched cabinetry. Besides punching just one hole at a time with the originally supplied tool, and the frequent tool sharpening required, the tool often distorted portions of the sheet, compromising quality and resulting in scrapped parts. • How can we proceed with some assurance that the productivity payback will measure up to expectation? • How do we determine the right number of punches in the cluster assembly? • Can reliable projected savings be realized ahead of time to justify the cost of the new tooling? • How certain can we be about the performance and quality of the new tooling? Answers to these questions came quickly as Dedoes ultimately invested in a nine-hole cluster punch from Mate. The fully guided design of the tooling system used at Dedoes pays off particularly when punched sheets have more holes than sheetmetal, by preventing the occurrence of side-loading and twisting forces. 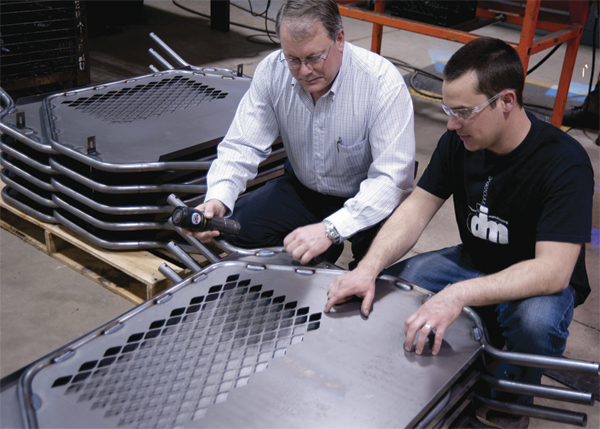 Shown are Mate sales engineer Gary Troxell (left) and Dedoes machine operator Pat Vaughn. Tool design started with the tooling material itself. Dedoes’ cluster punch is made of M2 tool steel that resists the abrasive effects of the stainless steel by reducing heat buildup in the punches. To obtain optimal tool performance, Mate heattreats its punches in NC-controlled furnaces. This combination of high-grade tool steel and heattreating results in punches with excellent compressive strength and high wear resistance. Further, punch points are machined with a ¼-deg. back taper to reduce friction during the stripping phase of the punching cycle, further extending tool life. Another concern when punching stainless steel is slug pulling, addressed by the tool’s special hourglass shape that creates a pressure point acting as a one- door to prevent slugs from pulling back out of the die. Once squeezed through this pressure point, slugs fall free from the tooling. Dedoes finds this important to maintaining uninterrupted top press speed, which for the Vipros ranges from 270 to 400 hits/min. Lastly, Vaughn notes that the fully guided design of the tooling system prevents the occurrence of side-loading and twisting forces, avoiding premature tool-edge cracks, dulling and galling. 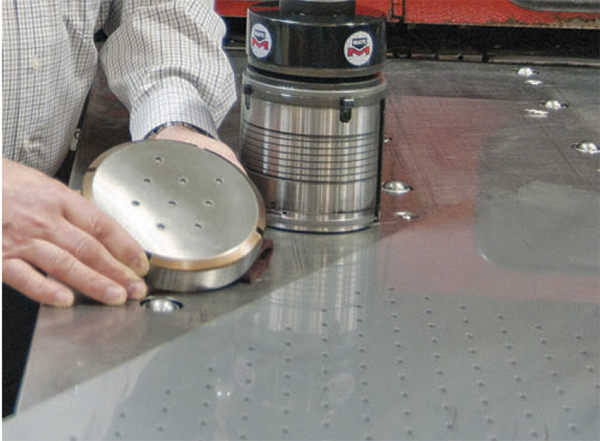 Fully guided tooling provides a tight clearance between punch and stripper, optimizing rigidity. In addition to the slitting tool and cluster punch, Dedoes also uses Mate louver tools for computer cabinets; embossing tools for floor pans; and lance and form tools to enable cabinet assembly.